Easily the most popular garden vegetable, the tomato comes in a variety of sizes, shapes, and colors. The plants, however, fall into two categories. Determinate varieties stop growing taller when they reach a certain height and need minimal support, making them ideal for containers. Indeterminate varieties just keep on growing taller and taller, like Jack's beanstalk! Indeterminate tomatoes require trellising but yield more fruit per square foot of garden space. 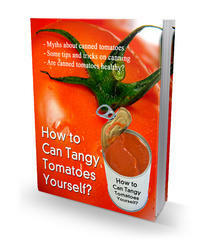 Most gardeners grow tomatoes for three main purposes: slicing, snacks, and sauce. Some of my favorite standard, round, slicing tomato varieties include Celebrity and Early Girl (red), Brandywine (pink), Lemon Boy (yellow), Big Rainbow (striped yellow and red), and Big Beef (red). For snacking, I like cherry-tomato varieties Sun Gold (gold), Super Sweet 100 (red), Sweet Million (red), and Yellow Pear (yellow). My favorite plum tomatoes, which I use to make sauce, include Amish Paste, Roma, Bellstar, Heinz 2653, and Viva Italia. Planting and care: Tomatoes grow best when transplanted into 60-degree soil and kept warm. Plant tall and leggy tomato transplants up to within 4 inches of their tops in a deep hole, or lay them on their side in a trench (see Figure 13-4), and the stem will root. Place a tomato cage or trellis support around the plants at planting time. Tie or wind indeterminate varieties around their supports as they grow, and prune off extra side shoots to keep the plant from getting too bushy. Care: Mulching with black landscape fabric in cool areas helps speed the growth of tomato plants. Tomatoes need fertile soil, so amend the soil with compost before planting and then side-dress plants monthly with a complete fertilizer. Keep the plants mulched and well watered to prevent blossom-end rot (discoloration and decay on the end opposite the stem) as fruits mature. Harvesting: Allow the fruits to turn red (or yellow, gold, or whatever the mature color). The longer you leave them on the vine, the deeper the color, and the sweeter and fuller the fruit flavor. Even if you pick too early, however, fruits continue ripening if they're placed in a warm, airy room. 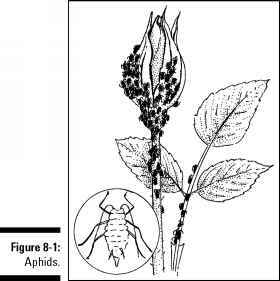 Pests and diseases: The main insect pests are tomato hornworms and tomato fruitworms. Both of these caterpillars can be controlled with Bt, although you can easily handpick hornworms because they're so large. Nematodes can also attack tomato roots, causing the roots to be deformed and the plants to be stunted and unproductive. Choose nematode-resistant varieties if these microscopic soil pests are a problem in your area. Leaf blight diseases often start as small spots on leaves and then expand to yellow areas, killing leaves and the plant if unchecked. To control these diseases, clean up crop debris at the end of the growing season, rotate crops, and mulch to prevent the disease spores from splashing onto leaves during rains. Wilt diseases, such as verticillium and fusarium, can cause plants to wilt and die in midseason. Purchase plants that are wilt resistant (usually indicated in the variety description), and remove and destroy infected plants as soon as you can to prevent the disease from spreading. What is killing my tomato plants?